Partners are already helping organizations leverage the GDPR as a competitive differentiator. They recognize that customers need to trust their data will be properly managed-or they’ll likely take their business elsewhere. In fact, according to Forrester, 74 percent of consumers are prepared to switch to a competitor if their bank or insurer suffers a data breach. * That’s why partners like you have assumed the role of trusted advisor, to not only help customers meet GDPR requirements, but also elevate the conversation and offer additional client value. Today, we’re announcing two Microsoft 365 intelligent compliance solutions to help assess and manage compliance risks. They’ll also help you to identify, classify, protect, and monitor sensitive data within hybrid and heterogeneous environments-across devices and apps-so you can help customers more efficiently manage their own unique paths toward GDPR compliance. Now available for Microsoft Azure, Microsoft Dynamics 365, and Office 365 business and enterprise customers in public clouds. It can help you simplify regulation-to-audit compliance processes for Microsoft cloud services in the context of regulatory requirements like the GDPR. Compliance Score, a Compliance Manager feature, enables ongoing risk assessments, with a risk-based score reference that gives you visibility into customers’ compliance performance against data protection regulatory requirements (e.g., GDPR, ISO 27001, HIPAA). Gain actionable insights and step-by-step guidance to help improve customers’ data protection capabilities and to simplify compliance processes through built-in control management and audit-ready reporting tools. 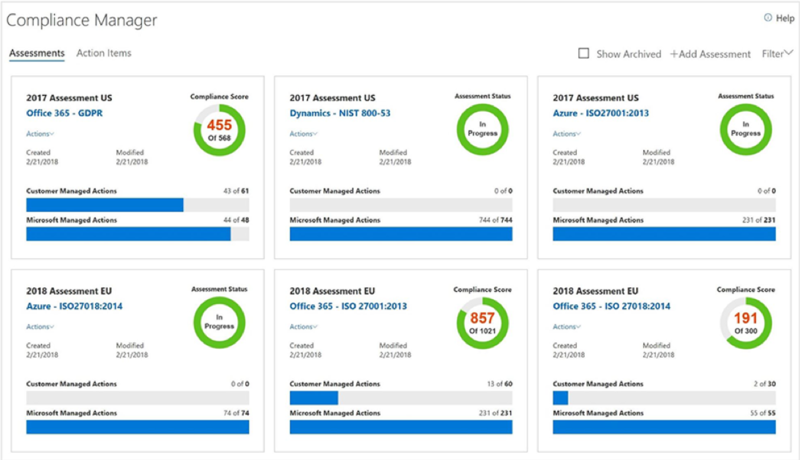 Compliance Score is currently available for Office 365 and will roll out to other Microsoft cloud services soon. -Jeff Fowler, Federal Sr. Cloud Strategist, Planet Technologies, Inc.
Now available for Microsoft 365 E5, Enterprise Mobility + Security E5, and Azure Information Protection P2. 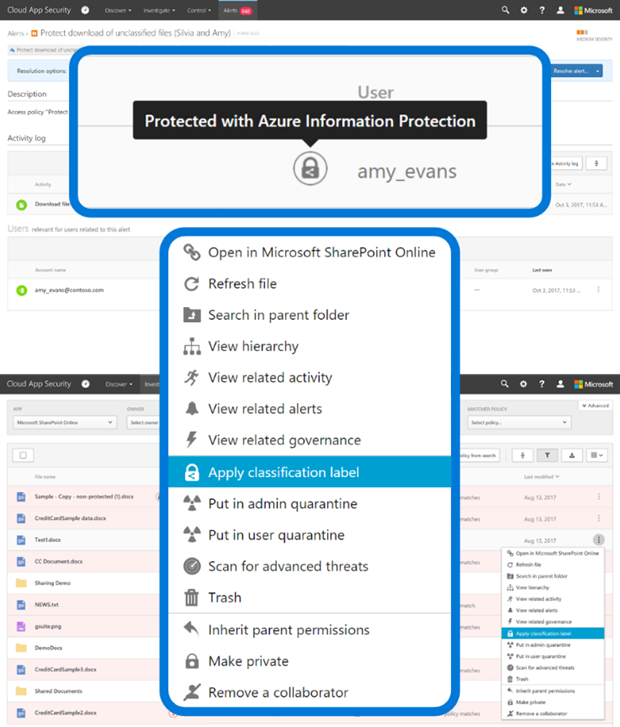 It lets you configure policies to automatically discover, classify, label, and protect documents in on-premises repositories like file servers and on-premises SharePoint servers. That way, you can address both hybrid and on-premises scenarios. It can also be configured to periodically scan repositories based on company policies. We’ve assembled a list of more than 200 partners to help meet the growing demand for GDPR support. Microsoft is also connecting partners who don’t have in-house compliance capabilities with partners who have complementary offerings, enabling them to collectively provide a holistic customer GDPR solution. If you’d like to be included in this list, please contact your Partner Development Manager. We’re always happy to welcome more security and compliance partners. Adaquest Inc. Advania AS Aeris Teknoloji Cozumleri Ltd. Sti. AGIC TECHNOLOGY AGILISYS LTD Agitavit Solutions d.o.o. Cognism Coligo AB Combis d.o.o. E.S.C. BVBA ECONOCOM Edgile Inc.
Intellinet Corporation Intercept B.V. Interlink Cloud Advisors; Inc.
ITEN Solutions IT-Haus GmbH ITMAGINATION Sp. z o.o. NEOS SOFTWARE DEVELOPP INTEGRATION netvisory srl Network One Distribution S.R.L. PWC QS solutions Quinfox Automatisering B.V.
Stone Computers AD STRAWBERRY GLOBAL TECHNOLOGY Successfully Managed Services NL B.V.
TAJMAC IT Solutions TAROX AG TECH-ARROW; a.s. UTILIZE PLC Valid VirtDB Zrt. VNEXT WeSafe IT West Ip Communications Inc.
What tools have been helpful in getting your customers GDPR compliant? Share about it with the Microsoft Partner Community here.